A goal and an assist from Glenn Murray helped Crystal Palace move 11 points clear of the relegation zone with victory over Stoke City. Striker Mame Diouf put Stoke ahead with a cool finish after Charlie Adam's deflected free-kick fell into his path. Murray scored a penalty after goalkeeper Amir Begovic fouled Yannick Bolasie in the Stoke area. 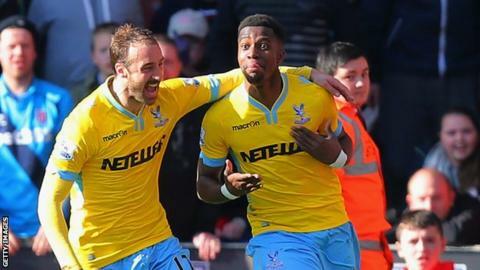 Wilfried Zaha made it 2-1 with a low strike after Murray flicked on a long ball from goalkeeper Julian Speroni. Palace were in the bottom three when Alan Pardew took charge in January but their form since he took over has meant the Eagles are now comfortable in mid-table. They have won eight of their 13 matches under the former Newcastle manager in all competitions. This was their fifth away league victory of the season but a win looked unlikely for most of the first half. The Eagles looked short on ideas and failed to register a shot on target before their equaliser. Palace were backed by 2,921 fans after the club provided free travel to the Britannia Stadium but their supporters had little to shout about until Begovic's foul on Bolasie. Bolasie was already being held back by Ryan Shawcross as he chased a through ball and the winger went down as Begovic mistimed his challenge in the area. Murray confidently converted the penalty, driving his spot-kick high into the centre of the net for his fourth goal in as many matches. Zaha had struggled to make an impact on the game until stoppage time at the end of the first half, when he took advantage of some poor Stoke defending to score. Speroni's long ball was flicked on by Murray and Zaha slotted the ball low beyond Begovic. Palace came close to extending their lead early in the second half when Scott Dann's volley came back off the post after the defender controlled the ball with his chest from a corner. But after that spell, the visitors were indebted to Speroni for preserving the lead as a succession of devilish deliveries from Charlie Adam kept the pressure on. Goalkeeper Speroni denied Stephen Ireland when Marko Arnautovic's deflected shot fell to the midfielder 10 yards from goal and produced an instinctive save from Steven N'Zonzi's flick six yards out. Stoke had claims for a penalty turned down by referee Andre Marriner when Diouf's shot hit Joel Ward's arms as the defender made a desperate block 15 yards out. Pardew has said he believes 37 points will be enough to seal safety and they are now a point short of that target. "We started brightly but we made two mistakes at the end of the first half. "We felt that the penalty was harsh on Asmir Begovic. Yannick Bolasie went in high with his boot and that was dangerous play. "We got caught out with two straight balls and we've been punished for both of them. "The best save of the match was from their defender [Joel Ward], who made a smothering save. Why it's a penalty I don't know. That should have been 2-2 and then I would have backed us to win the game." "Stoke were terrific so we really had to dig deep. "Character got us the win today and this is one of the best teams I've managed for that. Incredible character. "I'm overjoyed for the players because they worked really hard, we had to dig deep. "To get to 36 points is us done really. With eight games and the way we're playing you'd expect us to be there." Match ends, Stoke City 1, Crystal Palace 2. Second Half ends, Stoke City 1, Crystal Palace 2. Foul by Shola Ameobi (Crystal Palace). Attempt missed. Mame Biram Diouf (Stoke City) right footed shot from outside the box is too high. Attempt missed. Ryan Shawcross (Stoke City) header from the centre of the box is just a bit too high. Assisted by Charlie Adam with a cross following a corner. Corner, Stoke City. Conceded by Joe Ledley. Substitution, Crystal Palace. Shola Ameobi replaces Glenn Murray. Attempt missed. Mame Biram Diouf (Stoke City) left footed shot from a difficult angle on the right is close, but misses to the right following a set piece situation. Attempt saved. Yannick Bolasie (Crystal Palace) left footed shot from the centre of the box is saved in the centre of the goal. Assisted by Martin Kelly. Attempt blocked. Yannick Bolasie (Crystal Palace) right footed shot from outside the box is blocked. Assisted by Damien Delaney. Substitution, Stoke City. Jonathan Walters replaces Peter Crouch. Substitution, Crystal Palace. Martin Kelly replaces Pape Souaré. Attempt missed. Peter Crouch (Stoke City) header from the centre of the box is just a bit too high. Assisted by Charlie Adam with a cross following a corner. Corner, Stoke City. Conceded by Julian Speroni. Corner, Stoke City. Conceded by Joel Ward. Attempt missed. Ryan Shawcross (Stoke City) header from the left side of the six yard box misses to the right. Assisted by Charlie Adam with a cross following a corner. Foul by Pape Souaré (Crystal Palace). Attempt blocked. Mame Biram Diouf (Stoke City) right footed shot from the centre of the box is blocked. Assisted by Steven N'Zonzi with a cross. Dangerous play by Jason Puncheon (Crystal Palace).